This small yet chipper bed and breakfast enjoys a practical location on Aberfoyle Main Street next to the Scottish Wool Centre. Private parking provided for guests. Sadly this friendly little guest house is open only from March to November, but seasonal availability aside, there's much to recommend it: it's affordably priced, it's centrally located and the owners go out of their way to make your stay as comfortable as possible. It's also good news for all those cyclists amongst you as you can leave your bikes securely parked-up in the garage. This is a terrific little option if you are in the area for doing the Rob Roy Way or spending much of your day shuttling between Stirling and sightseeing areas like Loch Ard. A good mix of single, double and king-sized bedrooms are all on offer and a continental or full Scottish breakfast is included in the price (which work out at around £27 per person per night). 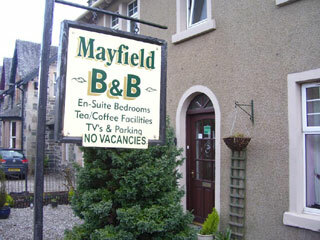 All rooms at the Mayfield are en suite and have tea/coffee making facilities. Television and oil central heating is offered as standard. Perks include a conservatory to relax in and FREE wi-fi. Call +44 (0) 1877 382962 for more info or to book.